Many custom builders, architects, and designers have become adept at creating green homes that offer tangible benefits such as lower operating costs and improved indoor air quality and comfort. But there’s more than one way to achieve sustainability. Many custom builders, architects, and designers have become adept at creating green homes that offer tangible benefits such as lower operating costs and improved indoor air quality and comfort. But there’s more than one way to achieve sustainability. As this article shows, a modestly sized home that maximizes passive solar heat gain and ventilation can work just as well as a large one where the clients opted for a hefty investment in alternative energy sources. Since all views are to the northeast, Brown placed windows and roof overhangs where they would get minimal solar heat gain during the day. On cool nights, the family enjoys gathering around the wood stove on the screened porch. When architect Tim Brown designed his home in Hays County, Texas, he wanted it to be as small as possible. In fact, he’d have preferred it to be smaller than 2,075 square feet, but his wife insisted on having a third bedroom. “I’m glad we [included that], because we have out-of-town guests from time to time,” says Brown, principal of Tim Brown Architecture in Austin. The home sits on 10 acres of land just west of the Austin city limits, but the footprint is only 2,120 square feet. The property appealed to Brown because it was naturally terraced and didn’t require a lot of site work. The home’s large shed roof faces north, so it receives no direct sun during the scorching Texas summers. Large windows and doors on the north side help keep the indoor environment comfortable. The living spaces aren’t large, but they connect and flow together well, “so it doesn’t feel like you’re in a tiny space,” says architect Tim Brown. Transom and clerestory windows can be opened to allow breezes to naturally ventilate the house. Passive ventilation plays a key role in conditioning the interior. Clerestory and transom windows allow cross breezes to flow throughout the house. 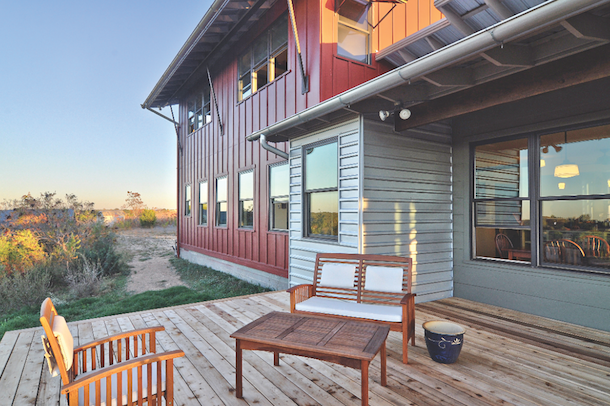 “The way it’s oriented to take advantage of prevailing winds is really nice,” says builder Cody Schmidt of Schmidt Custom Homes, Dripping Springs, Texas, noting that all the windows except one are operable. In a blower-door test, the home scored 0.7 air changes per hour (ACH). To meet Energy Star requirements, that figure must be 2.5 ACH or less; 1 ACH is considered excellent. In a duct-blaster test, air leakage was 3.8 percent. The acceptable level of leakage is 10 percent. The roof is Galvalume, an aluminum-zinc alloy coated sheet steel made by BIEC International. A portion of the home is sided with the same material. Three filters—sediment, charcoal, and ultraviolet—purify collected rainwater for drinking. The water is gravity-fed into two 10,000-gallon tanks, where it’s stored until needed. The home has low-flow faucets, dual-flush toilets and an efficient electric water heater that loses only one degree in temperature per day when it’s shut off. A recirculation system at each shower and bathtub ensures that water isn’t wasted as it heats up. Native grasses and plants don’t require irrigation. Brown convinced his trash-collection company to haul away recyclable materials from the site, which earned him extra points from the Austin Energy Green Building program. One of the family’s favorite spots is the screened porch on the west side. Two 3-foot-wide doors open onto it from the house. “We naturally ventilate four months out of the year,” Brown says. A multi-stage, zoned HVAC system covers 700 square feet per ton and removes humidity without lowering the temperature. 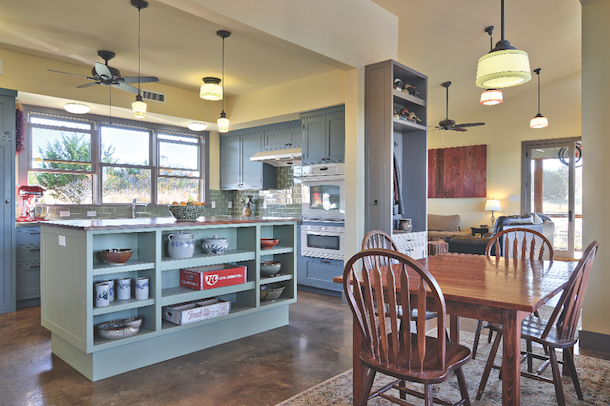 The home received a five-star rating (the highest possible) from the Austin Energy Green Building program, and achieved Gold in the NAHB’s National Green Building Program. Reclaimed merbau, an Asian hardwood, was used for the stair treads and the countertop on the kitchen island. 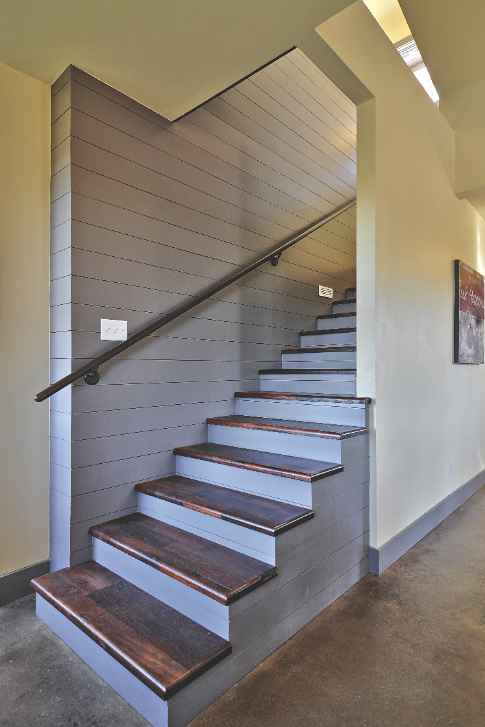 The shiplap detail on the wall is another flourish that builder Cody Schmidt especially likes. At the other end of the spectrum is a custom home in Oxford, Conn., that is nearly 8,000 square feet including the walkout lower level. Yet this home, too, is green. 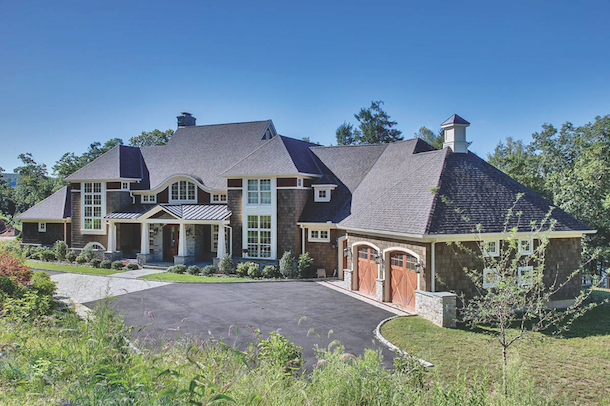 “This was going to be their last home, so the clients wanted their wish list fulfilled in every way,” says John Ricci, president of Ricci Construction Group, Cheshire, Conn.
For an active family that enjoys water sports, the opportunity to purchase two lots in a lakefront development was irresistible. Even though they were planning a large home, they wanted to use as little of the property, which totals 3.47 acres, as possible. 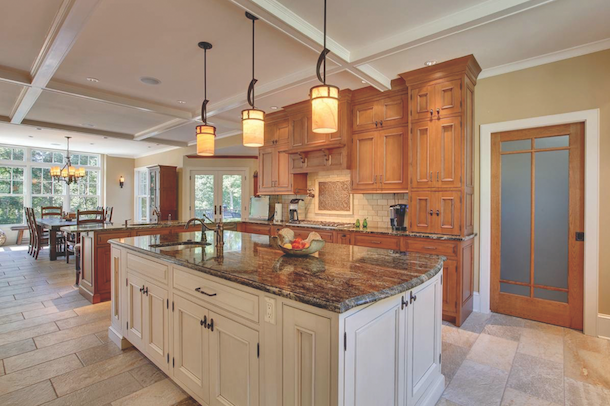 In lieu of a formal dining room, the clients have a large eat-in kitchen with a coffered ceiling, a walk-in pantry, a large island, and two-tone stained and painted custom cabinets. The HERS index of 43 is 56 percent better than a comparable code-built home. According to a blower-door test, the air infiltration value of the heating and cooling system is 5400 CFM at 50 Pascals. Five geothermal air-to-water, two-stage geothermal heat pumps exchange heat through closed-loop well fields located more than 400 feet below ground. The homeowners will recoup their investment in the geothermal system in 10 years, says builder John Ricci. Solar roof panels collect energy to heat water in large storage tanks, providing all the hot water for the family’s needs. The developer had previously excavated the site to use some of the material in road construction. Ricci had to re-excavate it to accommodate a 3-percent pitch on the driveway and build a 9-foot walkout basement. “With the road being higher than the top of the foundation it was a little tricky, but we built a retaining wall and brought the driveway along the front and put in some additional drainage,” he says. The first and second floors total 5,902 square feet, plus another 2,004 square feet of finished space on the lower level. Ricci was determined to make the home energy efficient and comfortable. Rooftop solar panels heat water in storage tanks for the family’s household needs, and a geothermal system heats and cools the home while keeping operating costs low. Closed-cell insulation in the outside walls and sealed ductwork keeps air infiltration to a minimum. Even though retirement isn’t yet on their horizon, the clients wanted to age in place, so Kemper put the master suite on the first floor. They wanted a lot of deck space, he says, and a private dock so the family can indulge in boating, water skiing, and other aquatic activities. 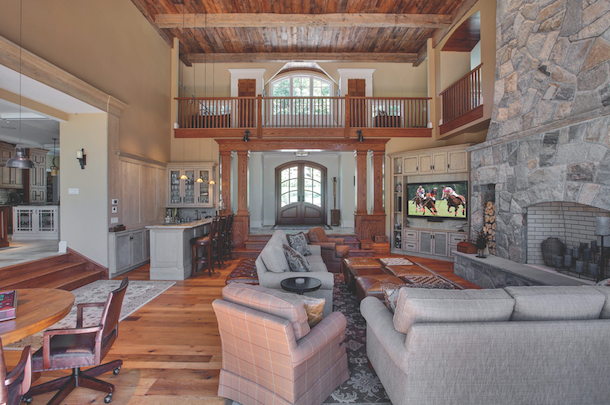 The great room has 21-foot ceilings with reclaimed wood beams that had to be crank-lifted into place. Rounding out the rustic look is a two-story stone fireplace and hickory columns in the entry foyer. The use of native wood species gives the home a warm and intimate ambience despite its size. The floors and interior doors are hickory, and the front entry and foyer has custom-crafted hickory columns. The office has a hickory coffered ceiling and a custom-built hickory fireplace mantel. Two staircases lead to the second floor, where the children’s bedrooms and guest suite are located. The guest suite has a private bath and kitchenette. 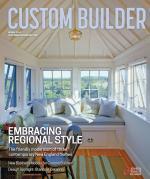 The home was named Best Custom Home (7,000 to 8,000 square feet) by the Home Builders & Remodelers Association of Connecticut. 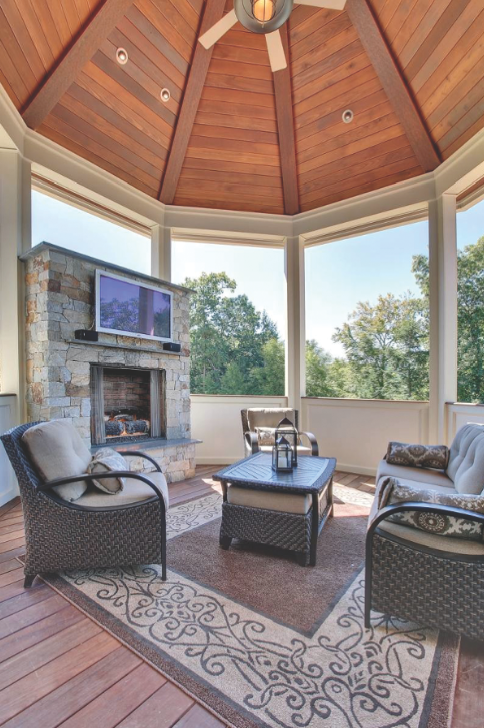 This open, gazebo-shaped porch, supported by tall pillars, has a flat-screen TV, a gas fireplace, a hot tub and views of the lake, the mountains and the swimming pool. Comments on: "Two ways to go green"